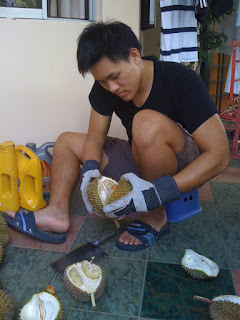 Is always nice eating durian, but do you like opening durian?? Especially when it is as much as the The picture only shows half of it, there are actually two big sack of durians thanks to my aunty =) And the job of opening up the durians falls on me sigh, looking at the amount of durians, i got a shock and i laugh while getting the gloves thinking my aunt is crazy. My job is to open up the durians while my mom and my aunt will place the durians in the tupperware and keep it in the freezer. Damn is kinda tiring opening all of it at once and when i finished my hand felt numb and my back was aching. Damn i would never wanna opened all of this at one go anymore. LOL!! 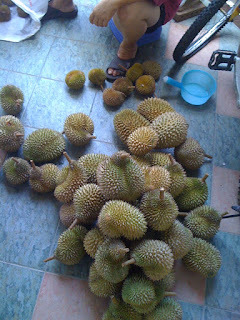 hey, durian durian! 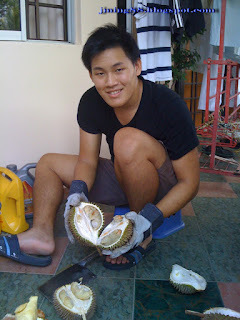 i like durian also! ate alot, until now got ulcer. too heaty i guess. ha!